Researchers from Singapore’s Institute of Bioengineering and Nanotechnology (IBN) of A*STAR and Quebec’s IREQ (Hydro-Québec’s research institute) have synthesized a new material that they say could more than double the energy capacity of lithium-ion batteries, allowing for longer-lasting rechargeable batteries for electric vehicles and mobile devices. The new material for battery cathodes (the + battery pole) in based on a “lithium orthosilicate-related” compound, Li2MnSiO4, combining lithium, manganese, silicon and oxygen, which the researchers found superior to conventional phosphate-based cathodes. They report an high initial charging capacity of 335 mAh/g (milliAmpere-hours per gram) in the journal Nano Energy. The researchers plan to further enhance their new cathode materials to create high-capacity lithium-ion batteries for commercialization. Tesla Motors is currently constructing the “Tesla Gigafactory,” the first massive lithium-ion battery manufacturing and reprocessing facility, in Nevada. It could churn out a total of 35 gigawatt-hours of lithium-ion battery packs per year, Transport Evolved reports. Li2MnSiO4@C porous nanoboxes have been synthesized via a wet-chemistry associated solid-state reaction method. The uniqueness of this material is the hollow nanostructure with a well-crystalline porous shell composed of phase-pure Li2MnSiO4 nanocrystals, which has not been reported previously. 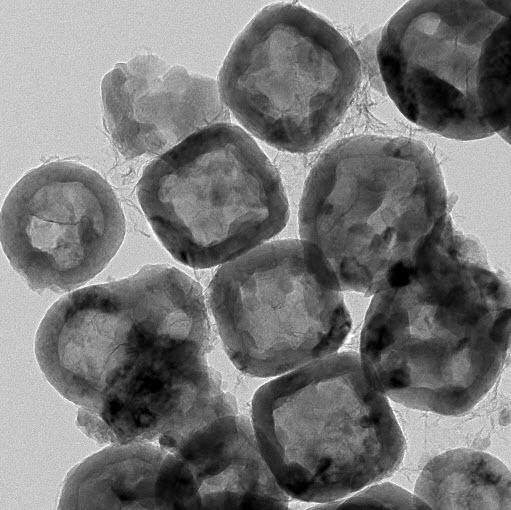 As evidenced by powder X-ray diffraction patterns and transmission electron microscopy images, the high phase purity and porous nanobox architecture were achieved via monodispersed MnCO3@SiO2 core–shell nanocubes with controlled shell thickness. Nanocomposite of Li2MnSiO4@C and reduced graphene oxide nanosheets demonstrated excellent performance as high-capacity cathode materials for Li-ion batteries.